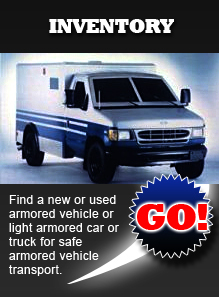 The Armored Group, LLC offers unrivaled sales, marketing and customer support for those in the market for armored vehicles, used armored trucks, money transport vehicles, tactical /swat trucks and prisoner transport vehicles. We create state-of-the-art armored vehicles, and continue to set the standard in our industry for customization, reliability and protection. Our comprehensive ballistic and blast protection offers unmatched safety, and we are equipped to serve customers and fulfill orders around the world. Members of our staff have extensive armored industry experience. We have many years of armored car operation experiences, and will work diligently to understand your business and security needs so that we may approach vehicle design and fleet considerations from your unique perspective. We have the ability and skills necessary to work together with clients to build the best armored vehicles available today. Our goal is to overcome the typical weaknesses inherent in some components of armored vehicle design today, and advance the design to "crew proof" the parts of the vehicle which in the past have been subject to premature fatigue or failure. Innovation advances our industry and yours! As a full-line commercial armored vehicle builder, we listen to our customers and quickly adapt to their needs by having the capability to engineer, design, build and service our vehicles anywhere in the world. With manufacturing plants in Canada, Dubai and Detroit certified and managed by fully qualified and experienced professionals, you can be assured of stringent quality controls, proven manufacturing systems and world-class certifications that meet the highest standards of safety.